With Visual Expert, enable team members to collaborate during your projects. They can work at the same time on the same VE project, for instance during a migration, or when maintaining a large application. The code analysis is done once on the server side, and then stored in a shared repository accessible to all teammates. Each team member can create a new VE project and share it with their colleagues. You can create as many VE projects as you need. No need for them to configure anything, select code, or analyze: they can immediately start using all of Visual Expert’s features. Anytime the code analysis is refreshed, the previous version is saved. All teammates with access to this project can browse earlier versions of the code, by opening a previous analysis from the Visual Expert UI. Developers can isolate a selection of components - for example the result of an impact analysis – in a new tab. Each tab is called a “view”. Developers can share their views and populate them on the server. Team members can then load the views anytime. The same view (tabpage and content) becomes instantly available in their Visual Expert UI. They can select any item in the view, and continue exploring their code from there. The code analysis is done on the server side for all the team. 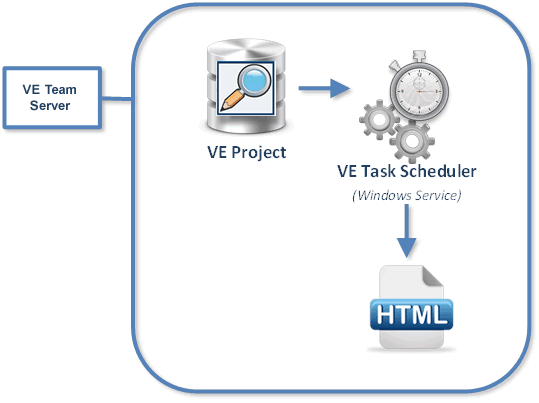 Visual Expert also comes with a Task Scheduler. The code analysis can be automatically refreshed on a regular basis. No need to pull resources from the Developer’s PC to analyze the code. The server also generates your code documentation. The Documentation is automatically refreshed on a regular basis. You can specify the documentation format, content, look and feel. Generated in the right location, the HTML documentation becomes accessible for any local or remote users. You can define the number of team members who can access the same project concurrently. No restriction on the number of named users accessing the system. You can install as many VE clients as you need, you’re only limited to the number of concurrent accesses. 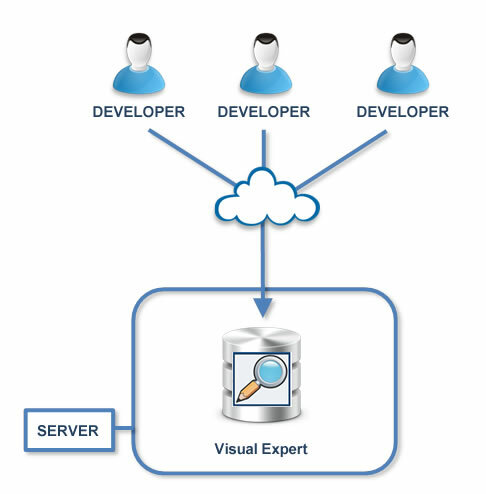 Visual Expert Team System is composed of several components. They are all installed with a single setup. A windows application, similar to the VE Client, with additional functionalities for collaborative and access control purposes. 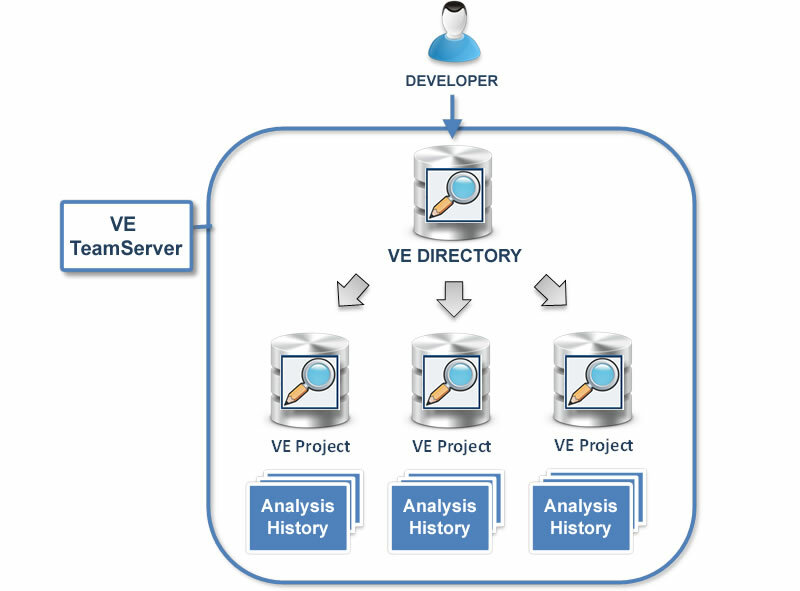 The VE Repository is hosted in Microsoft SQL Server; it is composed of several databases: one database for the project directory, plus one database to store each VE project, with its settings and code analyses. Small projects can run SQL Server Express Edition (Free of charge). Medium and large projects usually require a paid version of SQL Server (any paid version will do) in order to store larger volumes of data for the code analysis, and provide better response time by using several cores in parallel. A Windows Service, automating code analysis and documentation generation. It can automate tasks for several VE projects, and run on a fixed time and frequency, or when the computer is idle. 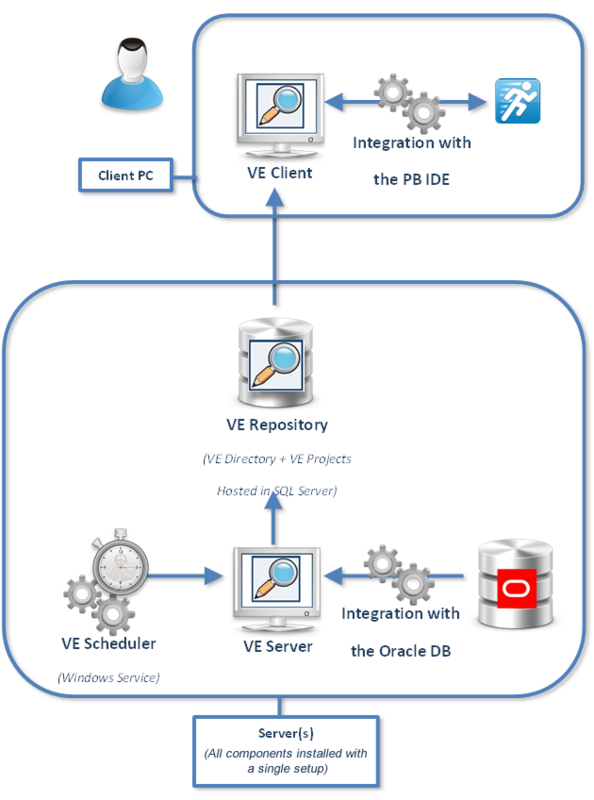 The VE Server integrates with an Oracle Database, in order to extract and analyze Oracle DB objects, and link them if needed to PowerBuilder components calling the Oracle back-end. The connection to an Oracle DB is optional. Users can choose to analyze Oracle code by reading files available on the network, or not even analyze Oracle code at all, and analyze PowerBuilder code only – especially if the PB application is not using Oracle. 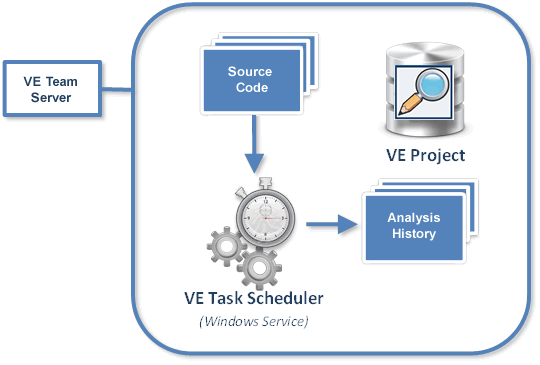 Windows application, installed on each and every team member’s PC; it connects to and queries the VE Repository when developers are exploring their code with Visual Expert. The VE client integrates with the PB IDE, in order to edit objects or methods selected in Visual Expert. The PB IDE is not required for Visual Expert to analyze PB Code. It only helps in editing PB code after pointing at it with Visual Expert.